Arizona Charlie’s Decatur is located in Las Vegas, Nev., on the Decatur Highway just three miles west of The Strip. McCarran International Airport is nine miles away. This unpretentious, western-themed casino hotel caters to locals and guests who desire a more casual atmosphere than that found on the Strip. 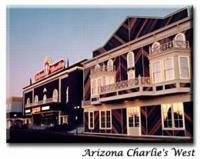 Arizona Charlie’s features a 90,000-square-foot casino with a 24-hour bingo parlor, table games and ample slot and keno machines. Patrons can easily imagine a Klondike mining town at the Sourdough Cafe. Traditional fare includes corned beef and cabbage, roast beef and pot roasts. Guests can experience a taste of the Gold Rush days while at the Frisco Market Buffet that serves breakfast, lunch and dinner buffets. Diners at the Yukon Grille enjoy tempting dishes that range from steak to raw oysters. Naughty Ladies Saloon offers complimentary nightly entertainment, including big band, R&B and karaoke. For recreation, guests can relax on the sundeck that borders a seasonal 50-foot- long freeform pool or ease into a soothing spa tub. 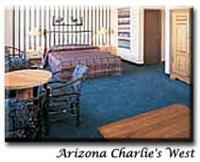 Arizona Charlie’s Decatur features 258 spacious guestrooms offering exquisite views of the mountains or the Strip. In addition to room service, guestroom amenities include dial-up Internet access, coffeemakers and cable television. Budget-conscious travelers will find Arizona Charlie’s Decatur a comfortable alternative to the Strip’s hectic pace.